Imagine that you have a Hard Disk that requires you to resize a chosen partition. This is possible on Linux thanks to LVM. With this in mind, this article will teach you how to Configure LVM on Linux Mint. However, you can apply this tutorial to any Linux distribution. 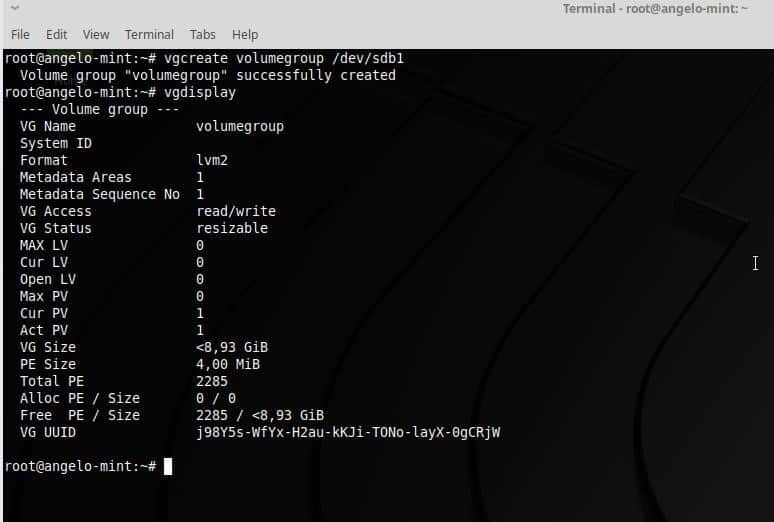 LVM is a logical volume manager developed for the Linux Kernel. Currently, there are 2 versions of LVM. LVM1 is practically out of support while LVM version 2 commonly called LVM2 is used. 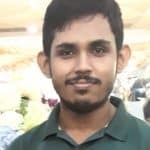 Read-only snapshots (LVM2 offers read and write). And the swap partition is 1Gb. This distribution could be correct and useful but imagine that we install many programs and the root partition fills up, but in personal files, there is practically no data and the /home partition has 20 Gb available. This is a bad use of the hard disk. 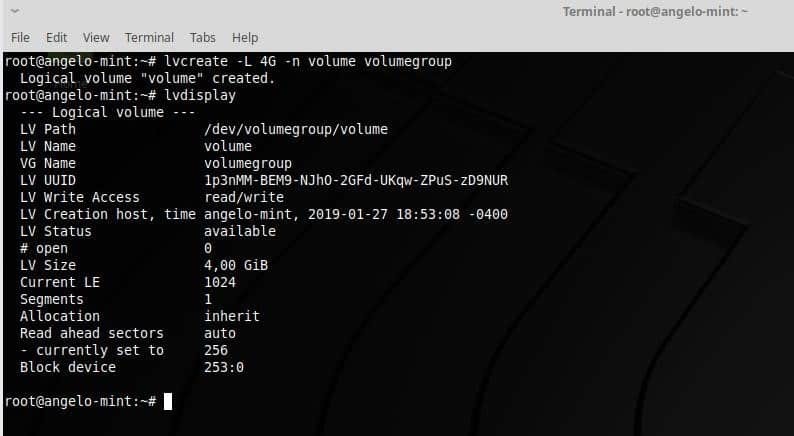 With LVM, the solution to this problem is simple, since you could simply reduce the partition containing /home and then increase the space allocated to the root directory. Physical Volume (PV): A PV is a physical volume, a hard drive, or a particular partition. Logical Volume (LV): an LV is a logical volume, it is the equivalent of a traditional partition in a system other than LVM. Volume Group (VG): a VG is a group of volumes, it can gather one or more PV. Physical Extent (PE): a PE is a part of each physical volume, of a fixed size. A physical volume is divided into multiple PEs of the same size. Logical extent (LE): an LE is a part of each fixed-size logical volume. A logical volume is divided into multiple LEs of the same size. Device mapper: is a generic Linux kernel framework that allows mapping one device from blocks to another. First of all, you must install the lvm2 package in your system. To do this, open a terminal emulator and write. Note that to execute this command you need super user privileges. Next, I am going to use fdisk to verify which partitions I have. Of course, you must also do this to ensure which are your partitions as well. As you can see, I have a second hard drive. In order for LVM to do its job, it is necessary to prepare the disk or partitions to be of the LVM type. Therefore, I have to do some work on the second hard disk called sdb. Next, press “n” key to create a new partition. Then, Press enter. Next, press “p” key to set the partition as a primary. Then, Press enter. Now, you have to press 1 to create it as the first partition of the disk. Then, Press enter. So, the next step is press “t” key to change the system identifier of a partition. Then, Press enter. And select LVM partition. To do it, type “8e”. Then, Press enter. So, type “w” key to write all the changes. NOTE: If you are going to work with several partitions, you must repeat this process with each of them. Now, we are ready to continue. To work with LVM we must first define the Physical Volumes (PV), for this we will use the pvcreate command. So, let us go. NOTE: If we had more than one partition, we would have to add them all to the PV. This is the central moment of the post because in this part we will create the logical volumes that will be like a normal partition. This command creates a logical volume of 4G of space over the previously created group. With lvdisplay you can check the LV. The next step is to format and mount the VL. Now, create a temporal folder and mount the VL on it. One of the most phenomenal possibilities of LVM is the possibility to increase the size of a logical volume in a very simple way. To do this, type the following command. Finally, it is necessary to reflect the same change in the file system, for this, run this command. 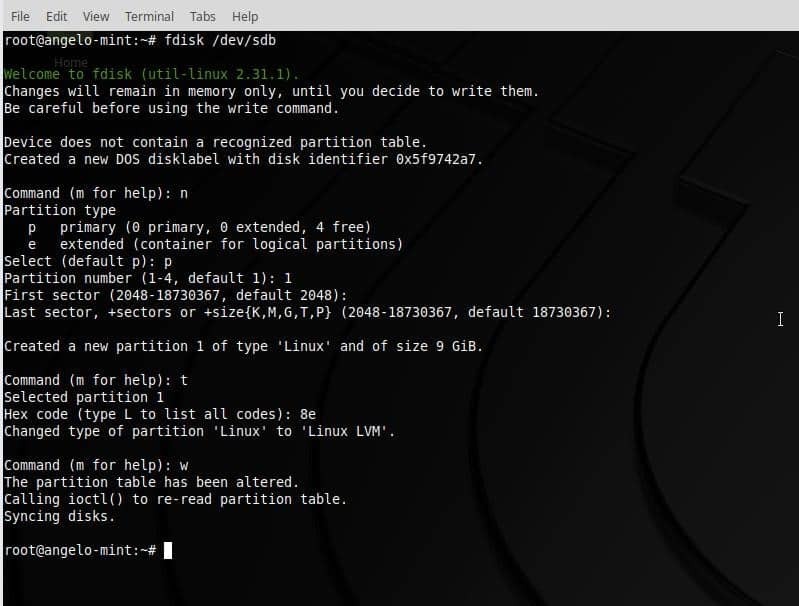 Learning to configure LVM in Linux Mint is a simple process that can save many problems when working with partitions. To do this, I invite you to read more about the subject since here I have shown you practical and simple examples on how to configure it.